All transactions are safe and secure with a reliable history in online purchasing behind each of our associates. 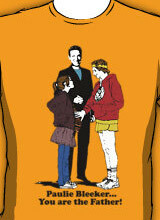 Buy the Paulie Bleeker You are the Father t-shirt to own Juno clothing and merchandise. These funny Paulie Bleeker Juno t-shirts display the couple on the Maury Povich talk show. Paulie has on his distractingly high-cut shorts and has his hand on Juno MacGuff's stomach. Maury announces, "Paulie Bleeker... You are the Father!" As if there was any doubt. Paulie is wearing his shorts with his maroon Dancing Elk Condors Juno hoodie that features a logo for the high school on the front. Use this tee to celebrate the news that was revealed on Maury. Pair it with a Juno Hamburger Phone for the ideal gift for the fan you know. In addition to the Paulie Bleeker You are the Father tee above, browse the Juno Clothing Gallery for more apparel like men's and women's clothes, kids shirts or hoodies.